← What’s in an olive? As the sun moves south and the nights get colder, and we realize that it will not be long before a killing frost, we begin to remember the good things about summer: the warm nights, not the storms and wind. We look back on our beautiful flowers and shrubs, not the backbreaking work to create those beautiful views. We’re not happy when we think that, very soon, they will be gone, gone until next summer. But wait! They do not have to be all gone. There is still time to salvage a lot of the garden, to enjoy through the dark fall and winter months. We can pick those last blooms now. We can dry them, retaining their colors, though they will probably not be as bright and beautiful as they were in July and August. It doesn’t take a whole lot of work, and virtually no expense. No garden? Open your eyes: The roadside is covered with pods and thistles and cones and everything. Let’s take a look. First of all, if you are going through any of the following processes, do begin with the best of the blooms that are available. Insect-eaten, diseased petals and leaves just are not going to look good. No matter which method you use, it all begins with picking the flowers. Choose a dry day and cut your flowers late in the afternoon, after all the moisture is gone. I like to select blooms that still have not reached their prime, or buds that are just opening. Once cut, remove all the leaves from the stems. That advice goes for all flowers that you will be drying, no matter what system you are going to use. Air-drying is the easiest method for preserving our flowers. To accomplish this, bunch six to 10 stems. Tie the bunch together with a rubber band, twine or some florist’s wire. Now, fool around with it, moving flowers here or there so that they are not touching each other. That helps them dry more quickly. When you have all the flowers bunched, find a place in the garage or storage shed and hang them, upside-down, from rafters. Do your best to select a location where there is a lot of air movement and no bright, burning sunlight. Too much light will tend to fade the flowers once dried, or it may wilt them prematurely. As you hang multiple bunches, be careful that the blooms do not touch each other. We don’t want them to tangle or bruise each other. This method will take, depending on the water content of the stems and blooms, anywhere from six days to two weeks. By the way, here are some flowers that dry easily via most methods. 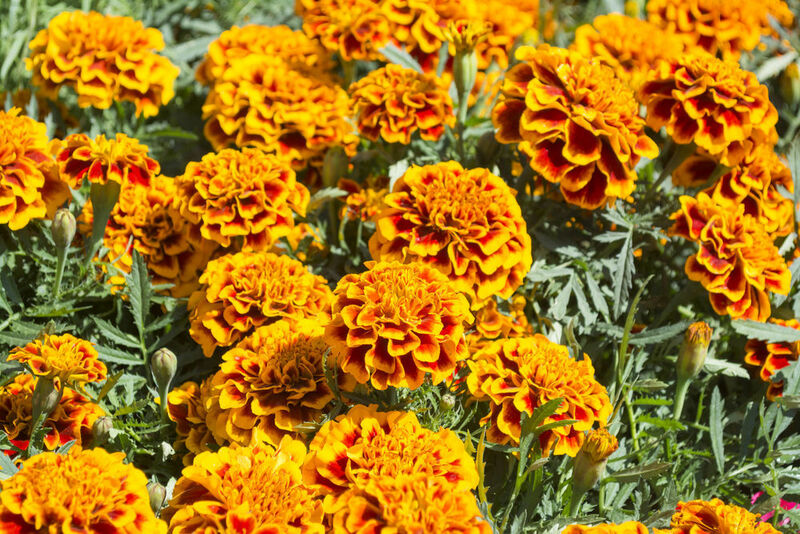 Marigolds of all types retain a lot of color; I think that the orange ones look a lot better than the yellows. Globe thistle, larkspur and lavender really work well with air drying. And that lavender has a great smell. Yarrow, strawflowers, statice and zinnias are among my favorites for drying. And, as you are looking through your garden, do not forget those wonderful seed pods. Poppy, love-in-the-mist and, yes, milkweed can add a lot of character to those arrangements that you are going to make. While you are at it, get out into that garden and, with your pruning shears, lop off a lot of branches, each 10 to 18 inches long, of foliage from shrubs and small trees. Hang them right next to the flowers. They will be a good background for the flowers and pods. Goldenrod dries well, too, hanging right next to your garden flowers, and though it’s not the greatest color when dried, it is a nice space filler. As you drive around the countryside, keep one eye on the roadside: It is a virtual banquet of seed pods, especially spike flower seed pods. You’ll need them for height. And don’t let those thistles go to waste. They’re wonderful in arrangements and winter door wreaths. This entry was posted in Bouquets, Florist, Flowers, Garden, Plants and tagged Auburn NY, beautiful flowers, Cosentino Florist, flowers, horticultural, perennial flower bed. Bookmark the permalink.